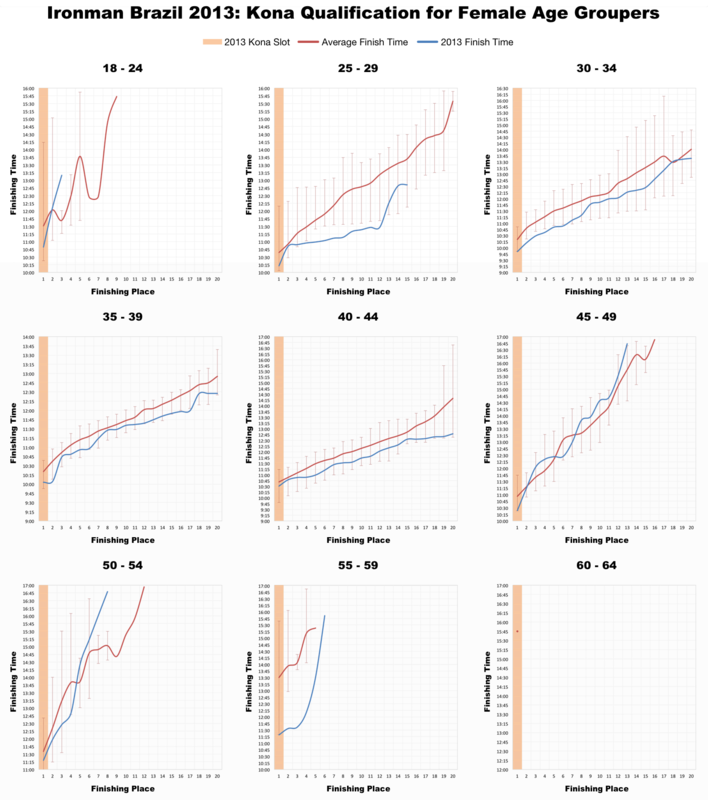 It was only when I came to plot the first graph I spotted that, once again, the Athlete Tracker had let me down – roughly 12 hours into the race all timing data vanished. 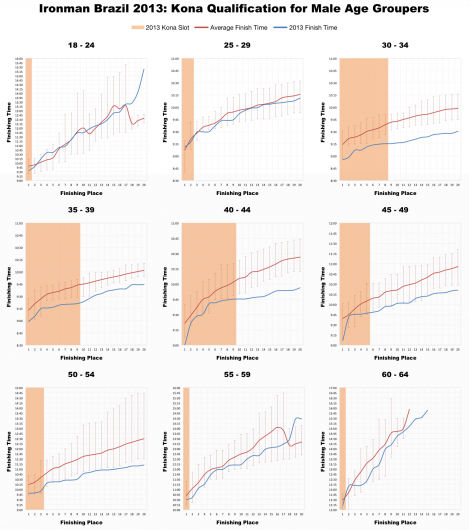 Resigned to presenting only half the age group story I was pleasantly surprised to discover that the original timing data and results were available on the Ironman Brazil website. A rare find now the brand and websites are becoming increasingly standardised. So while Ironman.com and the Athlete Tracker failed to offer complete results I was still able to do some analysis on a fast race. 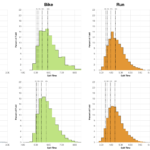 The distribution of finisher splits suggests this year’s race was by the books. Times are left skewed and generally fast with a thin tail of slower athletes at each stage. Any differences with previous events appear to be subtle – perhaps swim and bike are marginally faster, but the differences are small. 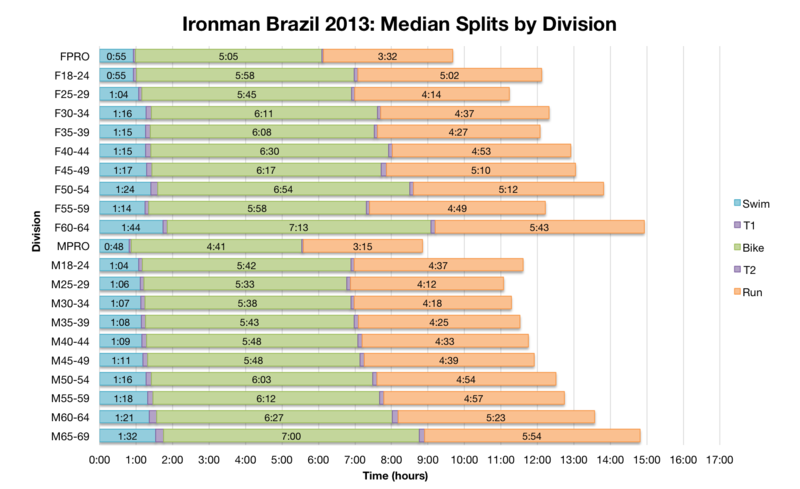 Looking at median splits by division gives a clearer impression of the relative speed of the day. Generally swim and bike are slightly faster than the ‘typical’ Ironman Brazil. 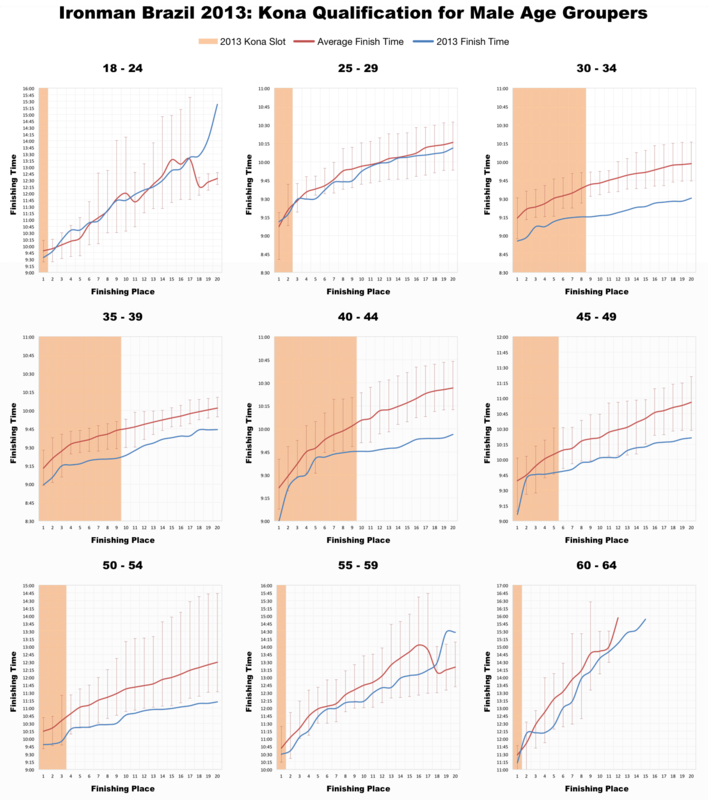 The run however presents a less clear picture with some age groups being faster and others slower so we’re probably looking at an on par marathon. 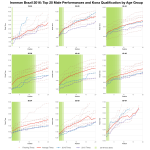 Fifty Kona slots worked out well for some of the prime male age groups with 8 or 9 slots available in the 30 through to 44 year old age divisions. 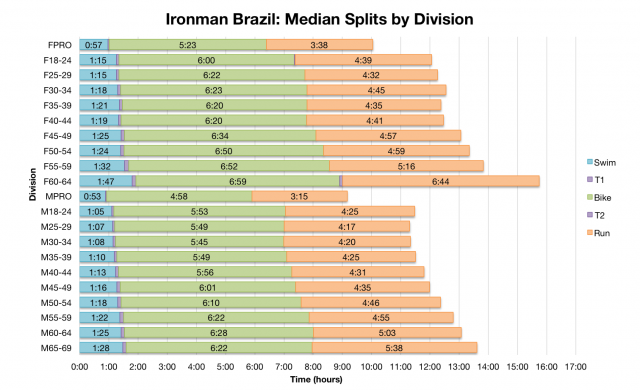 The scarcity of women racing in Florianópolis limited slot allocations to one per age division. 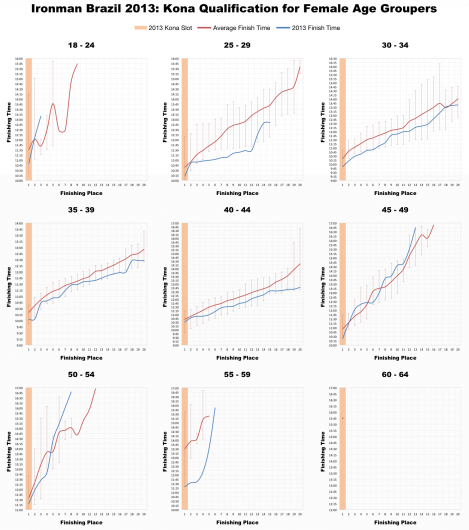 The picture presented by these graphs is pretty clear – this year the front-of-pack was fast. 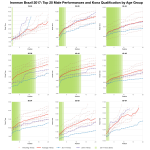 With one of two exceptions every age group shows performances faster than average and in some cases setting new best times for the age group positions. There may have been plenty of slots on offer, but you’d still need a solid 9:15 in the male 30-34 and 35-39 age groups. Not easy by any means and ahead of expectations set by previous races. I’ve uploaded the usual spreadsheet version of the 2013 Ironman Brazil results to Google Drive – this is the correct data from the Ironman Brazil website rather than the unreliable Athlete Tracker data. Conditions appear to have been very favourable from the course record time set in the professional field to the rapid qualification times required among the age group ranks. An already fast course became that little bit faster.